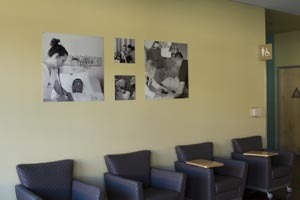 In January 2012, We completed our first permanent photography installation in the lobby of the Allied Health Building on Cabrillo College Main Campus in Apros Ca. 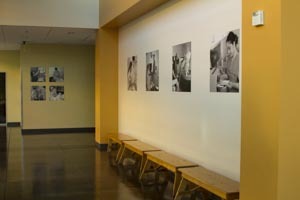 The installation features 12 images printed on metal and permanently affixed to the wall. Image sizes range from 12X12 inches to 30X30 inches. Note: while I do exhibit my work, it is not for sale. My aim is to educate and change the perceptions of the fully sighted toward work created by the visually impaired. I do donate my work on occasion depending on the charitable organization. 99 Pieces of art on the wall group exhibition and fundraiser for Access Gallery in the Santa Fe Art District, Denver Co.
Solo Exhibition at the Brunner Historical House Broomfield Co.
Exhibition of the Landscapes of the Body collection at the Dairy Arts Center Boulder Co.
Donating a Cyanotype print of St. Elmo ghost town for 99 Pieces of art on the wall group show fundraiser for Access Gallery in the Santa Fe Art District, Denver Co.
February 2017 Debut of my body-positive collection Landscapes of the Body at Access Gallery in the Santa Fe Art District, Denver Co.
99 Artists on the wall fundraiser for VSA Access Gallery Denver Co.
2012 Finalist Photographers Forum contest. Finalist 31st Annual College Photography contest.